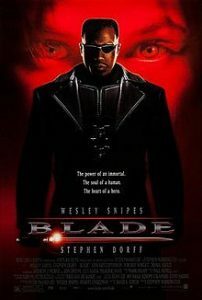 Blade is a day-walking vampire who possess an extraordinary vampire strength given to him at birth by his bitten mother. Trying to protect the human race, Blade confronts a relentless blood-thirsty vampire, named Deacon Frost, who is trying to resurrect an ancient vampire god. Blade is a precursor…one of the very first all-out action vampire movies, a genre that has become quite popular ever since. What’s great about Blade is the likeability of the two main heroes, performed by Wesley Snipes and Kris Kristofferson. Stephen Dorff also was tremendous as the ruthless Deacon Frost, the leader of a group of young club-going vampires. The filmmakers didn’t shy away from their use of gore and took advantage of the R rating. The result is an extremely violent movie. The gore could have been better though, if the filmmakers didn’t use the cheap trick of have the vampire to dissipate into ash when struck with silver. There are many horror movies out there that are pretty brainless, but Blade is brainless in its own way, meaning that it has instead top-notch fighting sequences and a story that’s fun and easy to follow. It feels slightly outdated today, but nostalgic in that it is one of the very first, fast-paced superhero movies, a kind of movie all too common nowadays.